These tender/crumbly, full-flavored scones feature cranberries and pecans. With oats in the dough, they're a tasty throwback to their Scottish origins. 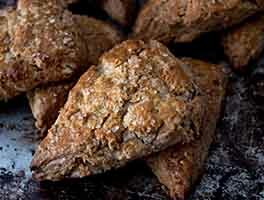 I've made many scones before, but this is by far the best recipe! Everyone loved them at a Christmas brunch. I decided to make them even more Christmassy by using King Arthur Flour Yuletide Fruit Mix instead of cranberries. I also added a few pinches of Yuletide Spice Mix and still used the chopped pecans. They were amazing scones! Thank you King Arthur for the recipe! Wow, yummy scones baked for pre-Christmas weekend guests. I'd never made scones before, I love eating them from bakeries but the "dryness" of them always intimidated me from baking. I was still worried when making these and how dry the batter was, but followed the directions and they turned out great. Though my teenage son said "did you have to add oatmeal to them" he still devoured them as did the other adult and teenage guests. Loved the craisin and walnut additions. Delicious Christmastime breakfast treat! 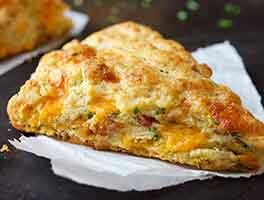 Best scone recipe ever! Not too sweet, and made with healthier, lower-fat ingredients. I usually substitute dried cherries and/or apricots. Think I need to make some soon! 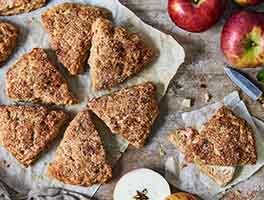 I was looking for an oat scone recipe, so I worked with this one and tweaked it a bit based on what I had in my kitchen. I subbed raisins for the cranberries, skipped the nuts, added a teaspoon of grated lemon zest, and used whole milk instead of the buttermilk/yogurt. I also cut the brown sugar in half. I made the dough and shaped the scones before bed, then baked them in the morning after brushing them with milk and sprinkling some turbinado sugar on top. They were perfecttender, plenty sweet enough, and beautiful. Look no further...bakers...BEWARE: These scones have caused me to view all other scones unfavorably. Toasty oatmeal, buttery pecans with tangy-sweet cranberries, no better scone than this! Tender, moist, delicious, and oh, so fragrant! Bake two batches...freeze one; delicious when re-heated to it's glorious toasty warmness in the toaster oven. My husband heated his frozen scones in the microwave oven (toaster oven was just too slow for his taste) and it was still perfect. I baked this recipe as written; it is perfection! I made these scones and really enjoyed the finished product with one caveat. 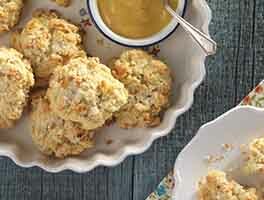 When made as directed, but substituting sour cream for the buttermilk as allowed, the mix was initially far too dry. Adding an additional 1/3-1/2 cup of half-and-half made things right. Perhaps the addition of an egg would have worked just as well. Absolutely tender and crumbly, nutty and sweet. The texture is light and airy without being cakey. Perfect. Very versatile recipe, too - I made a second batch with no nuts or craisins, but added the zest of an orange. They were just as good, though not as crumbly. Amazingly, even though I needed to do substitutions for soda (used 1.5t additional baking powder and removed the salt) and buttermilk (discovered I had no milk at all, so I used almond milk with 1 tsp orange juice to curdle it)... the recipe still worked out beautifully! Best scone recipe I've ever made, hands down. I love these scones. I didn't alter the recipe at all. they turned out perfect. Tender, slightly crumbly, delicious. Not sweet, just a touch of sweetness. I did put the sparkling sugar on top. These were intended to go in cookie plates to the neighbors, but unfortunately we are eating them too fast. Haha. sorry neighbors! My family and I loved this not-too-sweet scone recipe which will grace our table this Christmas morning! It was easy to make. I also added a touch of Fiori di Sicila and appreciate the suggestion from other reviewers. The citrus notes it adds are the perfect complement to the cranberries. Followed this recipe except I used dates in place of cranberries. The dough was very wet and sticky but the end result came out perfect! I'll definitely keep this in my recipe book. 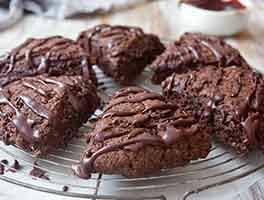 I was wondering if there would be any way to make these dairy free while keeping the same texture... Could I substitute the butter and buttermilk with flaxseed, almond butter, applesauce, coconut milk, or some other non dairy products?